Cake Wrecks: Sunday Sweets: Game On! Last week you may have heard all the brouhaha over the release of Portal 2. And you may also - like me - belong to certain social subsets that not only have no interest in video games, but would, upon questioning, ask what "port holes" have to do with anything anyway. Well, never fear, fellow gamer geeks! Because today's Sweets are all about video games, and this is a safe place to geek out *AND* enjoy amazingly made cakes. My favorite part? You could totally arrange the cupcakes to set up different game configurations. Maybe even do a little stop-motion animation. And then: NOMS. Ah, the law of miniatures: everything smaller is cuter. Whooooo...lives in Ryan's Rapture under the sea? Sub'd by Barbara G. & made by her brother, Doug. 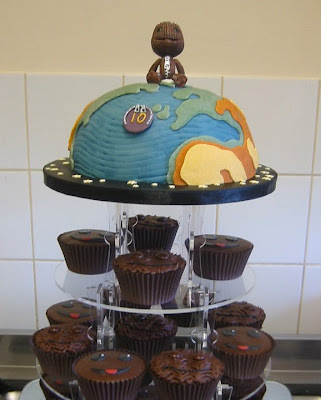 Amazing and detailed and edible is he! Plus I love the checkered floor. Remember: your weighted companion cube cannot speak. But if it could, I'm sure it would say, "I'm delicious." Who else remembers these? Eh? See? ADORABLE. And just look at all that detail! Ah-MAZ-ing. Really, I'm just a sucker for protagonists who'd make good plushies. More classics: we can't have a game post without Mario! Sub'd by Michael F. & made by his talented wife. Now THAT is a groom's cake. Gorgeous. Anyone else play Cut the Rope? I did for a bit, until it got too hard for my spatially-challenged brain. John loved it, though. Well, that's our Sweets for today. 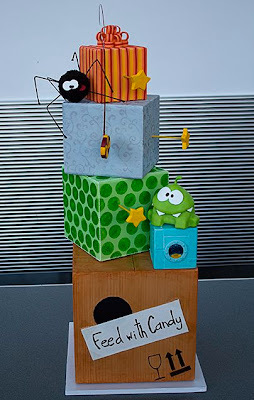 My favorite of the Angry Bird cakes (not featured here) is the playable cake. I saw the video of that one and that's what got me into the game. Amazing. I must really be OLD because the only two I have actually played are the Atari (ROCKS!!! We had like 50 games when I was a kid...before the earth's crust cooled.) and the top one (can't recall the name because of aforementioned being OLD). Great post! ok, i'm old. i was 15 when pong came out, and we got it finessed to where the thing would go back and forth over and over without us touching the game. we burned the tube in the television. *G* it had a shadow of the pong screen for the rest of its life. Pretty awesome cakes though! Love the Sunday Sweets posts. 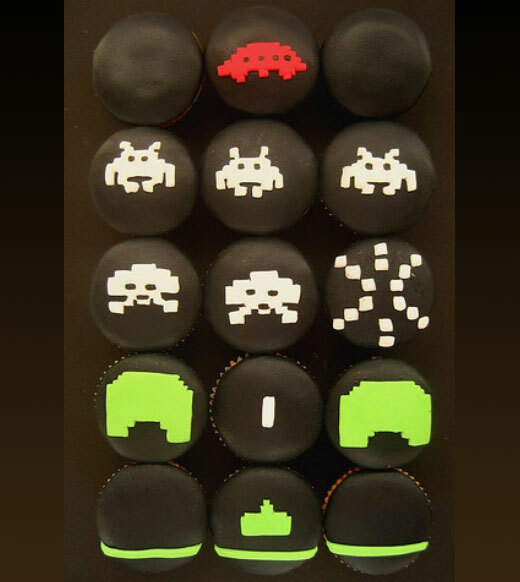 That Atari cake is by far my favorite!! AWESOME!! The Mario one is pretty great, too. 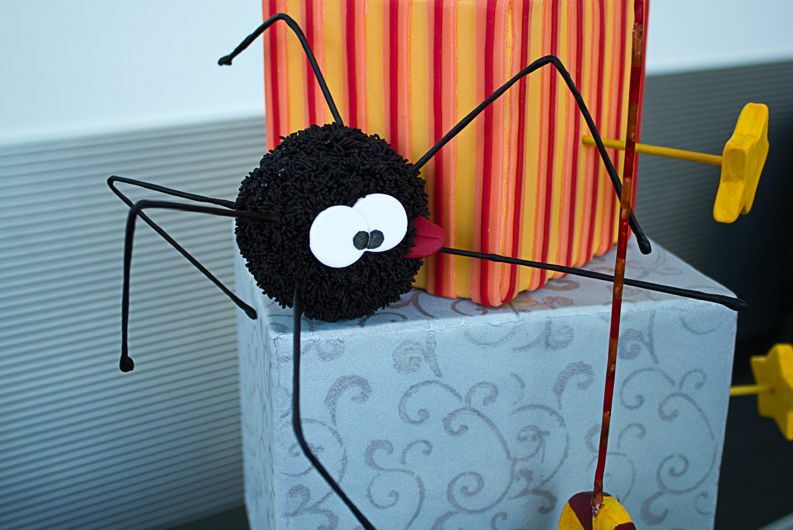 He'll love checking out these cakes! Yeah I'm twelve and now what pong and pacman are !!!!!! you absolutely HAVE to play Little Big Planet!! We'd be depressed, but would completely understand if you took a couple day hiatus to play through LBP and LBP2! Loved the cake too, they got the texture of the sack boy just right! I'm old enough that Space Invaders was the only one of these I've played, until last month, when I finally played Portal. And now I've played Portal 2. The Companion Cube cake is great. 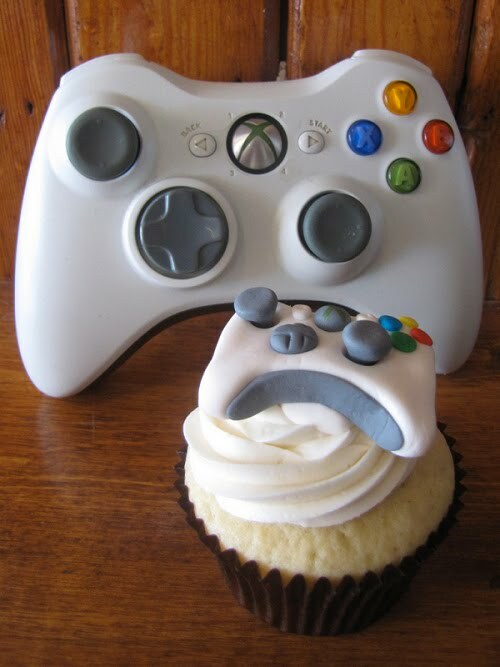 Ok, moving on....That Xbox controller is so gosh darn adorable, its a good thing its a cupcake becuase I want to eat it up! These are lovely, but I have to say I'm a little disappointed there's no post about the royal wedding cake. I was one of three people NOT paying attention to everything, but the one thing I was interested in was the cake. 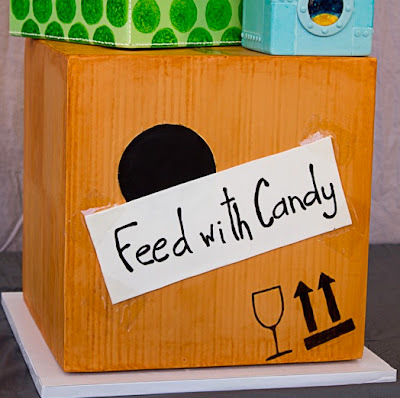 I've been waiting since Friday to see it featured here, since I figured: what an obvious nom-ination for a Sweet! Dear Jen...you just made my day..seriously amazing! Squee! 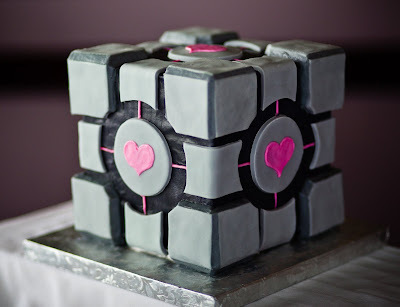 Now I have to go finish portal before work and then go bake a companion cube cake for my geeky boyfriend. Also, how have you NOT played little big planet! Its the cutest game EVER!. Oh my goodness, I love the machinarium cake! It's such a cute game too, you must play! You guys have got to play little big planet, it is amazing. 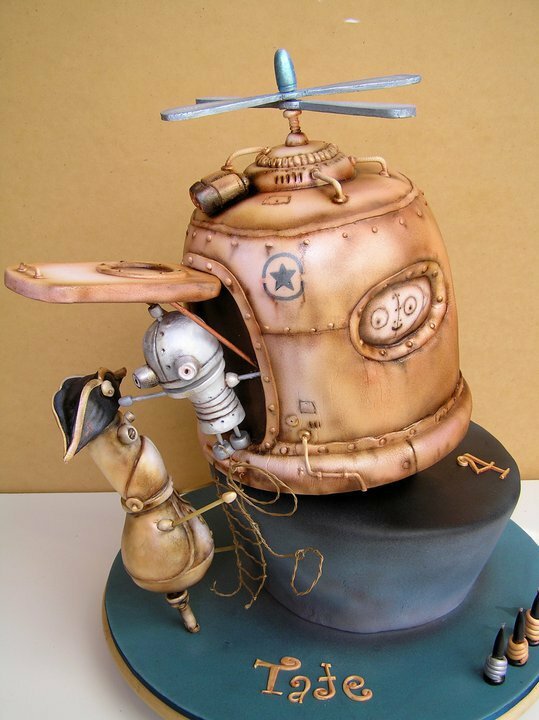 The second one just came out and it has a level that is all steam punk and cake themed. you shoot little cakes out of a hat! I love the Mario cake! Of course, I am partial to pretty much anything Mario related. 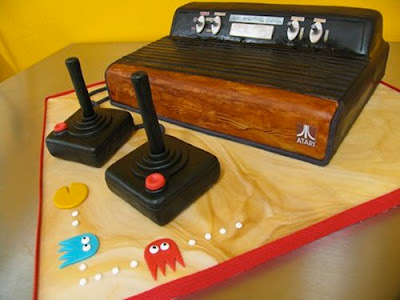 I have Atari, just like the cake pictured, sitting in my guest room because my husband refuses to part with it. If only it were a cake- We'd eat it, it would be gone, and I wouldn't have to dust it. 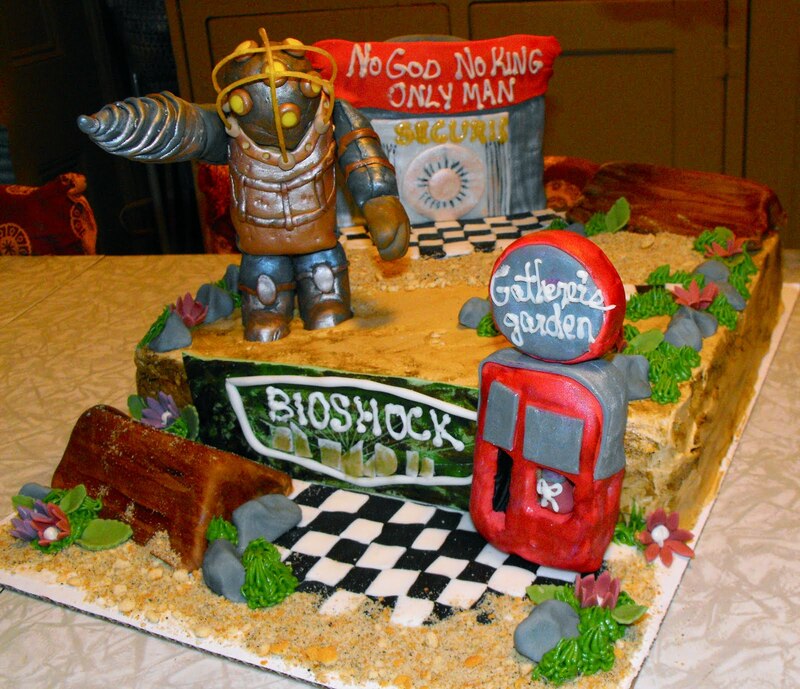 I would love to have the Bioshock cake.....however, that isn't Subject Delta. That's just a Bouncer Big Daddy, with the scary drill of death. oh, except to add to the "get playing LBP now!" bandwagon as well. I love these!!! They're so squee-worthy. I want that Zelda shield. Badly. It's soooo pretty! Hyrule!!!!! 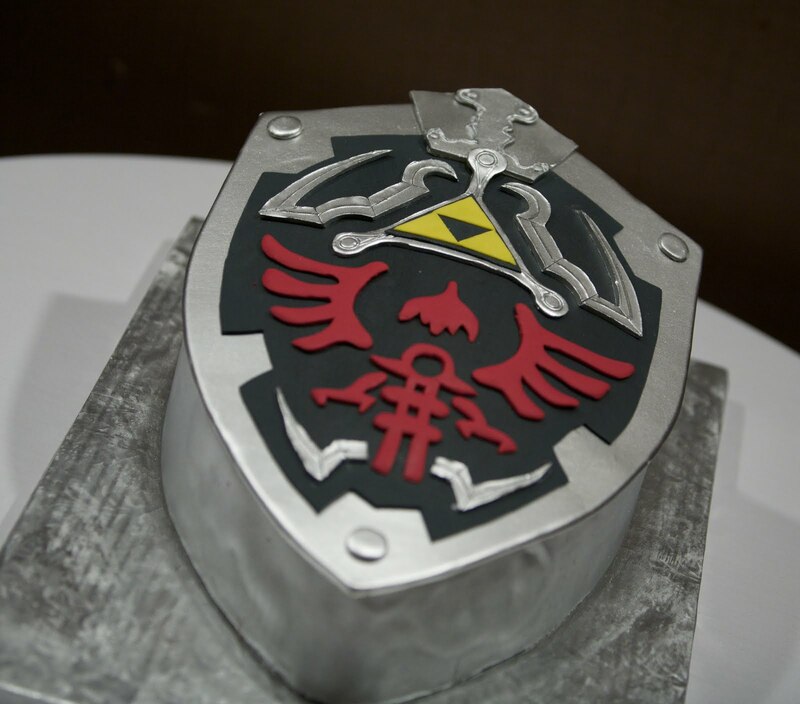 Can I have a Zelda wedding cake? Those aren't wrecks...they are fabulous. ooohhh I love the joysticks and the 'real wood' facing on the atari console. AWESOME! Cute! I love the Mario one, but I have to say may fave is the Cut the Rope one! And I will admit I am old, we used to have an Atari. It rocked! The robots were so freaking cute, too. Holy cuss! Packing tape. Who'd have thunk it? Cut the Rope kicks Angry Bird bootie any day, by the way. I just finished the first Portal too, and am now Companion Cube obsessed and planning how to make my own plush cube that will never be euthanized... love the corner detail on the cake version! OH my Gosh Jen! You absolutely MUST play Little Big Planet, you will looove it. I can't wait to play Part 2!! Hold on there, dearie. I have one of the original Nintendo systems. I may even remember when Pong was released. Or was that ping pong? Gotta go take a nap, now. I don't play video games myself..to old and missing the players gene, but from the first Mario game my boys got through to them moving out of the nest they always wanted Mom to watch and watch I did. Didn't watch the fighting games, yuck. Enjoyed the RPGs. Talking about cute, the lego games like the Star Wars, Indian Jones and Batman are pretty cute. Seeing these wonderful cakes to-day sure brings back memories. Thanks! 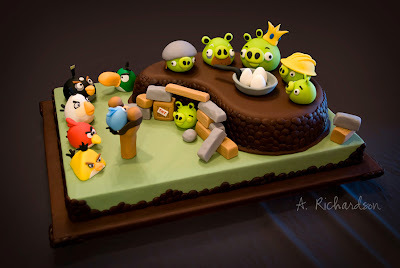 Squeeeeking over the Angry Birds cake. Wonder if it is too late to request one for Mother's Day? Keep up the great work, Jen & John & crew! Yay, companion cube cake! I'm having a stack of them made as my wedding cake in about a year. (eep!) Haven't decided yet, but the top tier just might be a proper black forest cake which will not be a lie. Heh, Kinda thought the Royal Wedding cake would get a look in today. It was all kinds of detailed amazingness! That Zelda one sure brought back memories... and the joysticks, hooooboy. Yep. I'm officially old. Love the Angry Birds cake! Sadly, the only thing I recognize here is the Atari. Yes, I really am that old. OH ... MY ... GOD! my sons 8th birthday is coming up and i think i wanna get something like the first cupcake one for his birthday, he'll love it! btw, i LOVE game inspired cakes, deffintly my all time fave! How appropriate is that these cakes took amazing skill and attention to detail to make -- just the kind of thing game-lovers would appreciate! LOVE these cakes. I am a sucker for any game-inspired cake regardless of whether it is a game I even play. 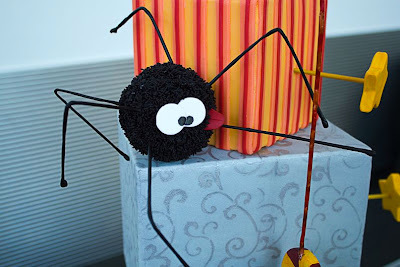 I know absolutely nothing about Cut the Rope, but that black spider/bug thing reminds me so, so much of the soot spirits from My Neighbor Totoro and Spirited Away...just with legs, lol. I am getting married in October. I am weird and so is my man. I am so hoping we have a good cake but because of the insane amount of time I spend on cake wrecks, I am scared. If there are ANY bakers from Southern Wisconsin WHO CAN DO WEIRD WITHOUT SCARY, PERVY OR STRANGE, PLEASE post here and let me find you. JEN, JOHN, I am scared I will end up here and not for a good reason. . . I want that cupcake with the lil itty bitty XBOX controller. So darn cute! 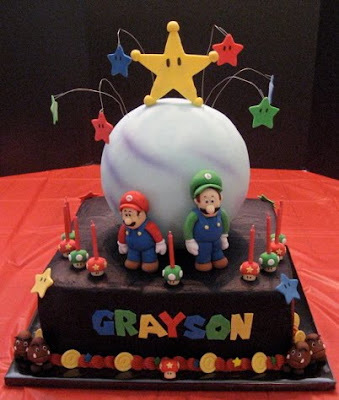 Plus that Mario cake is one I would love too lol. All great cakes. Wow, that one touch--the shiny tape--is blowing my mind. Love them all!! And definitely play machinarium sometime, it's a fun little game!! Love the old school cakes! The Atari looks just like the one I used to have, but I'm sure much more tasty. I hesitate to show my son the Xbox controller because he'll want me to make. Poor deluded child thinks I can do stuff like that. Have you guys tried "The Clockwork Man" & "The Clockwork Man: The Hidden World" yet? I finished the former in a night. ADORABLY steampunk! Also don't forget, as a side note, that Steampunk World's Fair is in Somerset, NJ, May 20-22. You totally need to play Little Big Planet! I'm not even a gamer and I love this game. The companion cube cake literally made me squee. I want a plushie of that thing. You should be making commision on these games! I just tried cut the rope (free) and purchased the full version about 4 minutes later. Such a fun game! That is the FIRST CCC I have seen and actually LIKED!!! SO...you claim to have no interest in video games: "And you may also - like me - belong to certain social subsets that not only have no interest in video games...." But then your post goes on to describe all the games on which these cakes are based (all of them awesome, by the way) and which ones you've played or want to play: "In honor of Portal 2's release, last weekend John and I finally played the first one - finishing up right around dawn. (Have I mentioned we have a hard time quitting a game once we've started? Heh.)" You MUST play Little Big Planet!!!!!!!!!!!!!!!!!!!! I am in shock you haven't yet!!!!!!! I heart the Cut the Rope cake!! It's absolutely impeccable! I have played that game obsessively until I beat every level with all 3 stars, which means I am oh so pathetic...but love it! I love the companion cube, but there's a mistake on the Zelda cake.